Over the past few years I’ve become enamored with a number of slice of life/moe shows, and these two genres of anime have become ones that I gravitate towards whenever a new season starts. For this reason I became interested in Is the Order a Rabbit? which is a slice of life/comedy that focuses on moe anime girls working in cafes. As with many of these series there’s a lot of cutesy comedy and not quite as much substance when it comes to the actual plot, and while it did take me a few episodes to fully warm up to the cast once I gained an appreciation for their nuances I couldn’t stop watching. It’s one of those anime that goes out of its way to be as overly adorable as possible, but viewers that enjoy that type of thing will find this one to be a series they’ll want to watch over and over again. Is the Order a Rabbit? stars Cocoa Hoto, who moves to a new town to attend high school. Rather than moving into an apartment or other building by herself, she moves to the Rabbit House café, where she pays for her board by working as a waitress. The café is run by the family of Chino Kafu, a shy and soft spoken girl who Cocoa quickly warms up to and declares will be her little sister. Rabbit House is your fairly normal café, aside from the fact that Chino is often seen with an oversized rabbit named Tippy that somehow possesses the spirit of her grandfather (a fact that none of the other characters ever realize over the course of the show). Working alongside Cocoa and Chino is Rize, the daughter of a soldier who strangely enough always seems to have a knife and gun on her despite being a fairly normal girl otherwise. Viewers are also introduced to Chiya and Sharo who both work at other cafes in the same town, as well as Chino’s friends Maya and Megu and a novelist who lives in town. If you can’t already tell, all of the characters are named after some kind of coffee or tea, and there’s a decent amount of emphasis on different types of coffee and tea in between the slice of life moments. With this core cast in place, the series spends much of its time providing laid back moments with a healthy dose of comedy. Essentially, it’s another anime focused on “cute girls being cute” only with cafes being the backdrop instead of a light music club or other scenario. Early on I wasn’t sure if this one was going to grab me quite as much as some of the others, as the emphasis in the first few episodes is mainly on Cocoa and Chino. Cocoa’s your stereotypical lead with a seemingly unlimited amount of energy, and how much enjoyment you get from this series will likely depend on whether you find her cute or annoying. Chino is almost the exact opposite, as she’s shy and soft spoken and tends to get easily embarrassed, but is quite knowledgeable about coffee and comes off as the more mature of the two despite being younger. What I liked about these two throughout Is the Order a Rabbit? is that even though they remained about the same throughout all of the episodes, there was a visible bond that seemed to get stronger over time. Though the series doesn’t have a specific overarching plot and is more focused on general slice of life scenarios in each episode, watching the bond develop between the main characters gave this one just a bit more depth than some of the other fluff anime out there. It also helps that the rest of the cast is fairly engaging and contribute to the humorous moments on a regular basis. Rize’s had a rather strange upbringing and been trained in various military exercises by her father despite possessing quite a few feminine qualities, while Chiya has a habit of giving all the items in her café the most extravagant and over the top names possible. There’s also Sharo, who is a scholarship student at Rize’s school, and while the series likes to make jokes on a regular basis about how she’s poor but the rest of the cast thinks she’s rich it’s never done in poor taste. Sharo’s also not able to handle caffeine, which leads to her appearing drunk after one cup of coffee or tea. By episode three Is the Order a Rabbit? has introduced all of its main cast members, and it was at this point that the series clicked with me and I found myself hooked until the end. At times it felt like a combination of a relaxing anime like Aria combined with the humor and sheer cuteness overload of many of the moe/slice of life series that have aired over the past five to six years. There’s just enough character development to keep it from feeling like complete fluff in between many of the skits, and the interplay between characters during many of the jokes worked quite well. Having recently gone back to watch the majority of the episodes for a second time in preparation for this review, I found that it was still just as much fun to watch and the cast remained just as appealing as they were early on. Plus, there’s plenty of moments that made me laugh quite a bit (such as when Cocoa tries to flip a pancake only to have it land right on Chino’s head), which has made many of the episodes continue to have plenty of appeal. White Fox was the main studio behind the production of this series, and while they started off with anime that was mainly in the action category (Kataganari, Jormungand) recently they’ve branched off into series with a more laid back, cute focus like Soni-Ani and Is the Order a Rabbit? It’s clear that they have a knack for this style as well, as each of the episodes is well animated and the cast remains as adorable as possible. What also drew me in was the overall look and feel of the town that Rabbit House and the other cafes are in, as it resembles a cross between a countryside town in Europe and a smaller Japanese town rather than the traditional big city or school setting that is so typical for a moe anime. There are a lot of small nuances that really make the animation pop right off the screen, and for a series that doesn’t have much in the way of plot and instead relies on random events and likeable characters it’s important that it remains eye catching. The voice cast also did a fantastic job, and those of you who watch a lot of anime of this type will likely notice some familiar voices. For the most part the actress for each character matches the personality type they’ve played in the past, as the energetic Cocoa is voiced by Ayane Sakura (Natsumi in Non Non Biyori and Yuiko from Love Lab) while Chino is voiced by Inori Minase (Suzune from Love Lab). The one exception is Rize, who is voiced by Risa Taneda, an actress I’ve usually seen playing fairly shy characters, so this was a nice surprise. I’ve also got to mention that both the opening and ending themes are sickly sweet, and the opening song is one that most people will have stuck in their head for quite some time after watching the first episode. 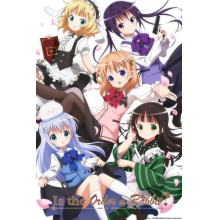 If you enjoy moe/slice of life anime Is the Order a Rabbit? comes highly recommended, as it has an engaging cast with just enough quirks to stand out from some of the others of the same type. It does take an episode or two to fully introduce and flesh out the main characters, but once the cuteness and humor begin to take over you’ll likely find that the series comes into its own and is a real joy to watch. There’s something genuinely relaxing about watching a slice of life set in cafes, and because so much of the series takes place outside of the stereotypical high school setting it comes off as a bit refreshing from the norm. A second season has already been announced, so it shouldn’t be too much longer before viewers are able to get re-acquainted with Cocoa and the rest of the café waitresses, but in the meantime there are plenty of reasons to return to these initial twelve episodes after that first time through.